Cakes can be made for any type of celebration. 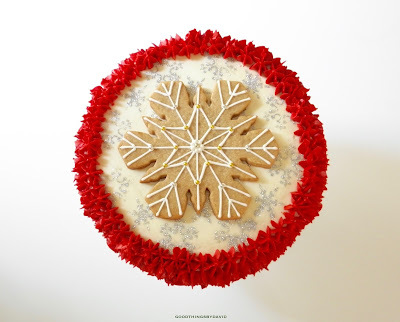 Recently I had the pleasure of creating a Snowflake Cake for a fun holiday party, and I thought to myself that the cake's design could easily lend itself for any kind of winter get-together. 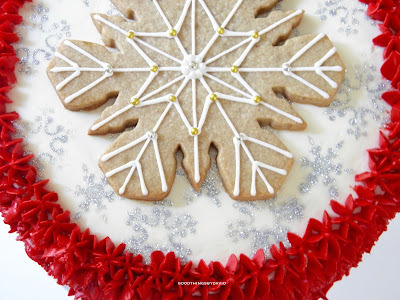 All you really need to do is bake the cake layers, bake a snowflake cookie or two if you wish, get a snowflake cake stencil and whip up a large batch of Swiss Meringue Buttercream. Putting it all together is when the fun begins. Tinting the buttercream is completely up to you. 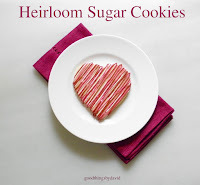 Leaving an all-white cake will certainly make it look frosty and snowy, but if you brighten it up with a bit of red gel paste coloring or any other hue, your cake is sure to stand out and be worthy of any dessert table. After the cake layers have baked and cooled, and the buttercream is made, apply a layer of buttercream to the bottom layer of one cake layer and add the top layer. Immediately crumb coat it and chill the layers until completely set (30 minutes to one hour). Coat the layers with a good amount of buttercream, smoothing it out so that the cake has a perfectly level top and smooth sides. Using a snowflake stencil large enough to cover the 9" diameter cake, carefully center it and gently press it to the top. With a small spatula or demitasse spoon, carefully sprinkle the silver disco dust (very similar to fine glitter) over the stencil cut outs, making sure to get every part of the snowflake design. Carefully remove the stencil so that you don't disturb the snowflake designs. Center a decorated snowflake cookie, pressing it down onto the buttercream as shown. Using a pastry bag fitted with a large 1M piping tip, pipe buttercream stars (tinted or not tinted) around the top perimeter, and continue to pipe horizontal rows down to the bottom. 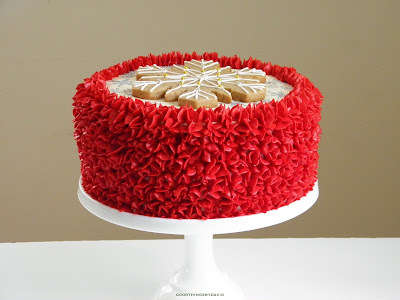 Use a rotating cake stand to make this job easier. 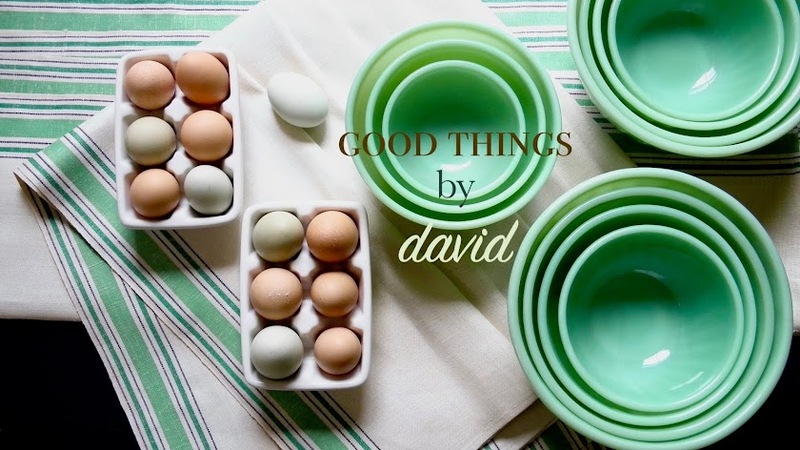 Thoroughly chill the cake before transferring it to a cake stand, cake box or serving platter. If you look closely, you can see how the stenciled snowflakes sparkle. A small amount of that shimmery disco dust goes a very long way. You'll love working with it if you haven't already. 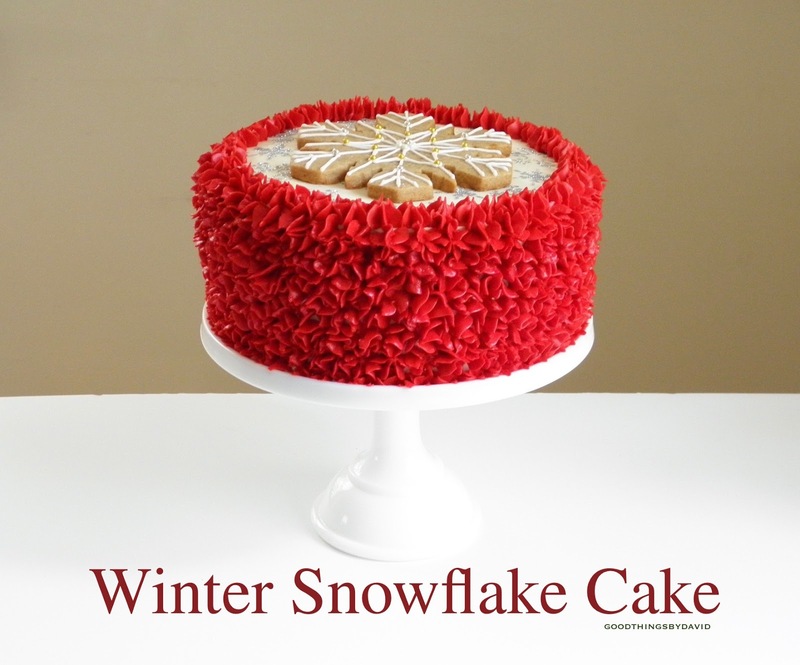 Set on top of a milk glass cake stand, the Winter Snowflake Cake looks outstanding. I have to say that the cake layers themselves are pretty tasty and easy to work with. They slice beautifully! Think about making a snowflake cake in the coming weeks for a special birthday or for anyone who likes layer cakes. It's going to turn some heads, and it's going to make people smile. More importantly, it's going to be devoured by all. That looks like a colorful dessert for sure. Who knew it was eggnog!? The eggnog part is not overwhelming. It gives the cake a not-too-sweet flavor that is good with buttercream. The flavors are not cloying. Exquisite as usual David. 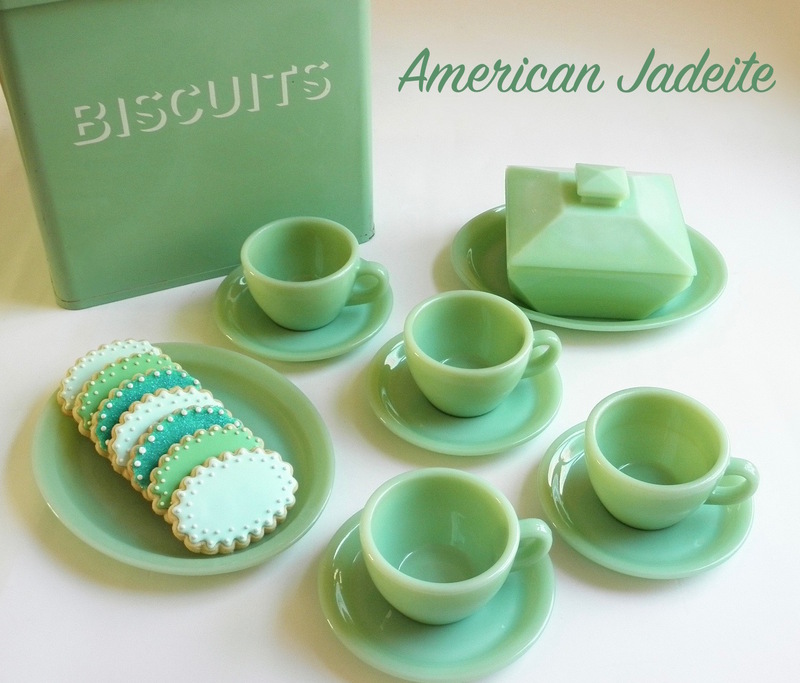 I just do not know where you find the time to do all this, blog, collect antiques and also keep a beautiful home. Goodness me!